Need a good Monday cry? Well English singer-songwriter Ed Sheeran has got you covered with his newly unveiled ballad "All of The Stars." It's a tender track made especially for the upcoming Shailene Woodley drama The Fault In Our Stars, that's soundtrack is now available for pre-order. The above music video gives little screentime to Woodley or Sheeran. Instead it mostly focuses on a wall of uplifting phrases and inspirational mottos like "Everything has beauty," "If opportunity doesn't knock, build a door," and "Be the change you want to see in the world." Based on the beloved novel by John Green, The Fault In Our Stars centers on two teens in love, but their romance faces some serious obstacles. Shailene Woodley stars as Hazel, a sixteen-year-old who has been fighting an aggressive strain of cancer for years. While reluctantly attending a support group for cancer-stricken kids, she meets the charming seventeen-year-old basketball player Augustus, played by Ansel Elgort. Together, the two learn that even lives that are cruelly short can be beautifully lived. Nat Wolff, Laura Dern, Sam Trammell, Mike Birbiglia, and Willem Dafoe co-star; Josh Boone directs. The music video for "All of The Stars" is doing more than announcing the pre-orderability of The Fault In Our Stars soundtrack. This charming vid is also meant to promote an upcoming live stream event featuring Ed Sheeran, Grouplove and Charli XCX as well as the cast of The Fault In Our Stars and author John Green. Mark your calendar because this celeb-stuffed live stream event will take place on May 14th at 6 PM PST/ 9 PM EST at The Fault In Our Stars homepage. 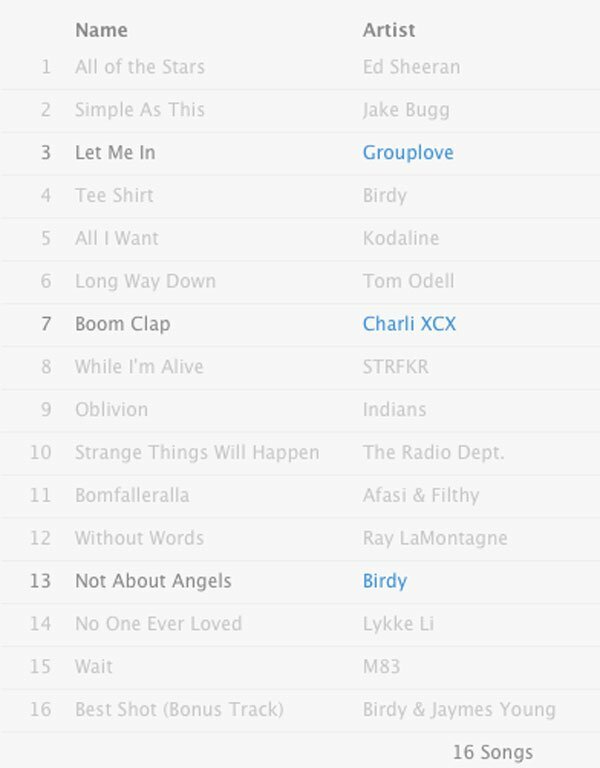 In the meantime, enjoy more tracks from The Fault In Our Stars below. First up, Ray LaMontagne's breathy and beautiful "Without Words." And lastly, Grouplove's official music video for "Let Me In." The Fault In Our Stars opens June 6th.